Some days it just doesn’t pay to even take the Land Raider out of the garage. Fresh off a thorough beat down at the hands of the Stompa led Ork /Chaos forces, the “Sons of Russ” were hoping for a shot of redemption. They were expecting this redemption to come by way of a rousing victory over this weeks nemesis. The local Space Marine Shriners Chapter. Unfortunately that plan was not in the cards. Meeting on the mean streets of “The Ruined City”, Shriner bikes quickly assembled and deployed, forcing the Wolves to deploy in response. As both armies entered the battle, the air was quickly filled with the roar of engines. Bikers moved aggressively through the streets, keeping profiles low, to position themselves for their assaults. That’s not to say, damage wasn’t done in the early stages. A predator, in support of the bikers, quickly dispatched his counterpart, destroying the Space Wolf Predator on his first shot. 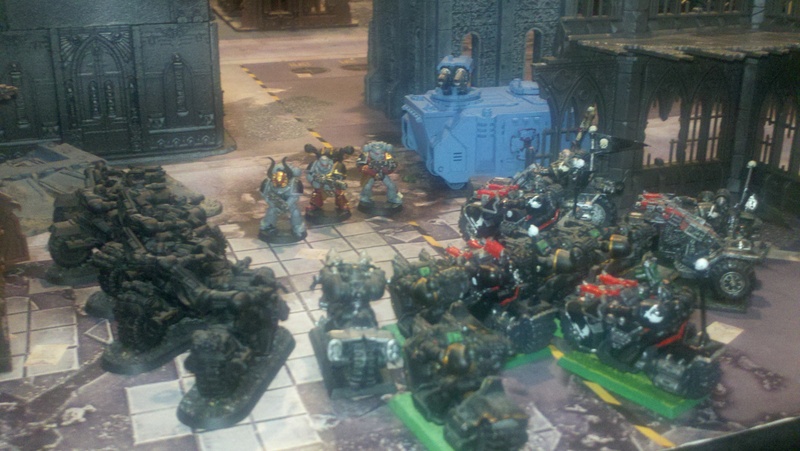 Space Wolves returned fire, but ineffectively, seemingly confused by the speed and movement by the bikers. The next round of Space Marine shooting, caused more pain to the Space Wolves. Utilizing their advanced targeting systems, the Techmarines were able to decimate a squad of Long Fangs with pinpoint shooting from a Thunderfire cannon. The Space Marine Land Raider was able to eliminate a rhino, exposing the troops inside to fire bolters and grenade launchers. Meanwhile the Space Wolf Dreadnought tried to bring it’s firepower to bear, but was shaken by another Las Cannon volley from the Space Marine Predator. The Space Wolves tried to regroup. Calls were made to reserve units, but went unheeded. Rune Priests wielded the powers of the warp, but the bikes proved impervious to this kind of witchcraft. Squads of bikers started the job of cleaning up wayward Space Wolves. Let's just call it a draw? In the main intersection of the city, the opposing Land Raiders approached each other, unfortunately for the Wolves, a quick blast of the Space Marine melta and the Wolf Land Raider exploded into a pile of metal and debris, leaving the Wolf Lord and his companions scrambling for a defensible position from the incoming assault. 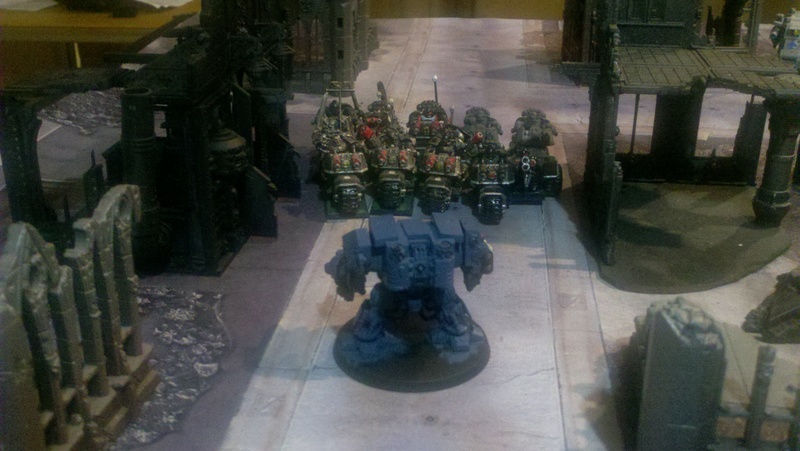 A squad of Space Marine terminators exploded from the confines of the the Land Raider, thunder hammers and lightning claws brandished, and slammed into the waiting squad of Grey Hunters and their Wolf Lord. In the end the speed and agility of the Shriner bikes, proved too much for the Wolves, who seemed slow and flat footed today. Posted on 07/11/2011, in Battle Reports. Bookmark the permalink. 1 Comment.